In the press release for the A350XWB, you can read the following. Conceived from the outset to become a comprehensive airliner Family, the A350 XWB will be available in three basic passenger versions, the A350-800 which can fly 270 passengers in a spacious three-class configuration up to 8,500 nm / 15,750 km, the A350-900 seating 314, and the A350-1000 which is designed for 350, both with ranges of up to 8,300nm / 15,400 km. The three passenger versions have a cruise speed of Mach 0.85. 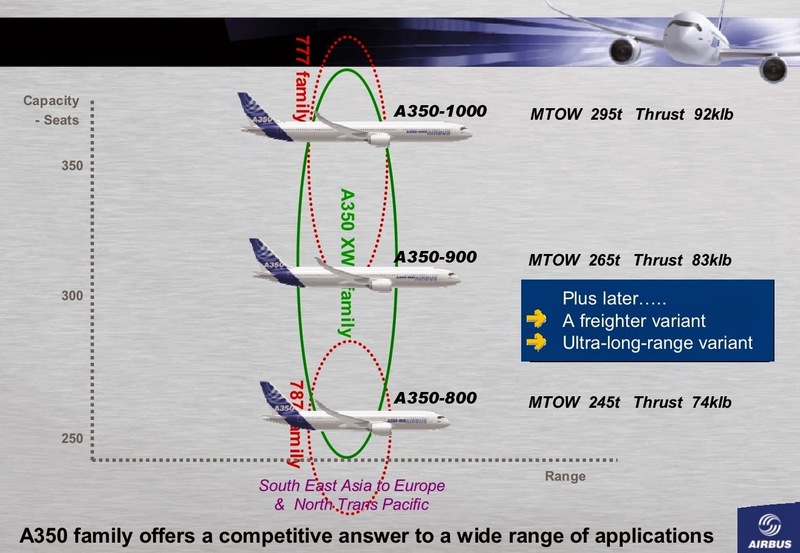 As an ultra long-range aircraft, the A350-900R will fly even further. A freighter version, the A350-900F will complement the passenger models. A350-900 is now advertised as having 315 seats and a range of 7,750 nm. The range is now reduced by more than 500 nmi!